Mother Nature is Amazing! The Matrix ( the pattern in the stone) is Outsrtanding. 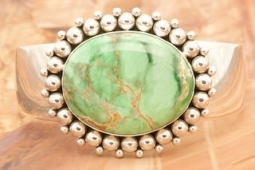 Genuine Variscite set in Heavy Gauge Sterling Silver Bracelet. Created by Navajo Artist Artie Yellowhorse. Signed by the artist. The Variscite stone is 1 1/4" x 1".